Orange you glad you're reading this? Today is my birthday. July 15th. When I was a kid, my Mom declared that your birthday was 'do anything you want within reason' day. If possible, she baked a special cake and made a meal from our favorite foods. I loved pound cake and shish-kabob so that was my menu. But in the hope of keeping this blog calorie-free, I'm only offering visual treats today. I've decided to indulge in my favorite color: orange. Ironically it's one of the colors I don't look good in-as my friend Sarah pointed out-but it makes me happy. The rose was a gift from my friends Sean and Sandra at The English Rose Flower Shop in Morehead City, NC. From the "I'll take ten yards of that-" department, a photo of a 1930s deco cheater patchwork. 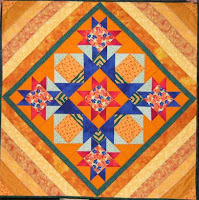 From Julia Renken, a student who only needed minimal encouragement, an orange two-block quilt she made as a result of a class. 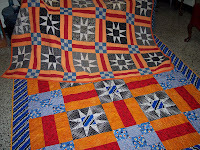 An oldie-but-goodie from my collection of southern orange quilts. It's a Baby Bunting pattern, made in the state of Georgia in the 1940s. 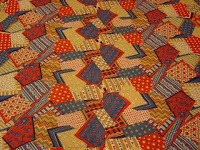 Here's a picture of two quilts that are ancestor and offspring. The older quilt (top) is 1940s and found in Michigan. The lower quilt is one I made. This color scheme solves the conundrum: how do you keep orange and black from looking too Halloween-y? Add red, white, and blue of course!